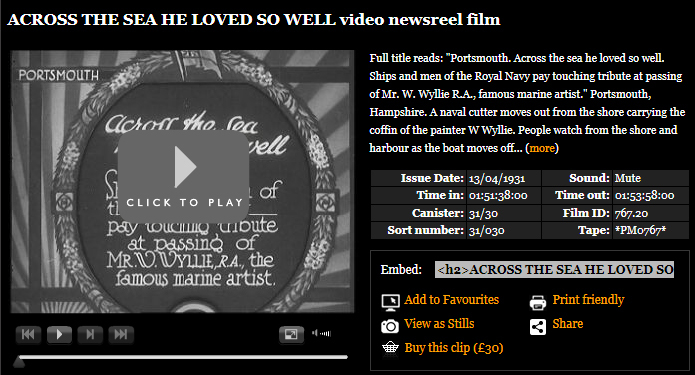 British Pathe News filmed Wyllie's water borne funeral cortege as it left from Point in Old Portsmouth and journeyed up the harbour to Portchester Castle, and later filmed his son Harold working on a ship model. 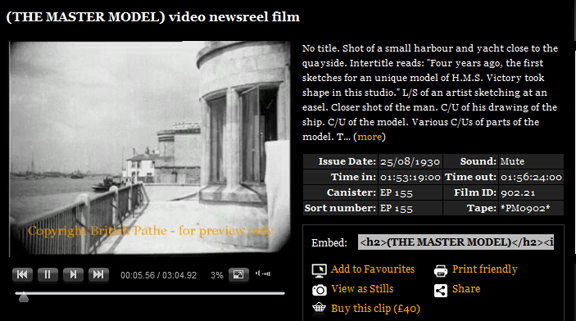 The film clips are in black and white with no sound, they can be viewed by clicking on the images below. The clips are preceeded by a few seconds of ads. Harold Wyllie was W.L. Wyllie's first son and an authority on the rigging of ships as well as being a good marine artist. He was also a skilled model maker, this British pathe clip from 1930 shows him working on a model of HMS Victory for the late Lord Louis Mounbatten.